Is The Rock School accredited? Yes, The Rock School is accredited by the Southern Association of Colleges and Schools (SACS/AdvancEd) and the Florida League of Christian Schools (FLOCS). Our faculty have a minimum of a four-year college degree, while some also hold an advanced degree. Our staff either hold a state teaching certificate or a certificate of accreditation. Do you have to be members of The Rock church to attend your school? No. While the school is housed on the property of the church and financially supported by The Rock of Gainesville, the school welcomes families from throughout the community to enroll. More than 40 different churches are currently represented in our student body and only 30% of students enrolled attend The Rock Church. Are there any scholarships or financial aid programs available? Yes. There are several state programs that provide scholarships to qualifying families. Additionally, the school offers tuition assistance to families who apply. For more details, visit our financial information page. K-12 classes are held Monday through Friday, 8:30 a.m. – 3:00 p.m. Preschool is open from 7:00 a.m. – 6:00 p.m.
Do you have before or after school supervision? Yes. Before school care is available from 7:00 – 8:00 a.m. at no charge. We have an elementary after school program that meets from 3:00 – 6:00 p.m. Aftercare is $8 per day or $80 per month (whichever is less). There is no enrollment necessary for Aftercare. Students may attend any days in which the parent requires them to do so and then are billed at the end of each month. How much is the tuition and fees for next school year? To obtain our tuition & fee schedule, please request an information packet and we will gladly send you an e-mail with that information. Or simply call the school office. The Rock School generally begins the third Thursday of August. We do complete the first semester and give exams prior to Christmas break. This allows us to start a new semester in January. 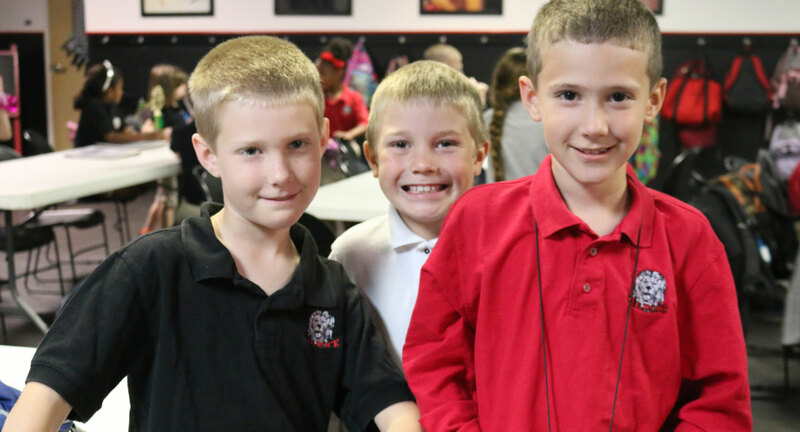 We utilize a variety of curriculum programs to offer the highest quality of education without sacrificing the Christian values at the heart of our school. We use traditional curriculum programs from Christian publishers such as A Beka, BJU Press, Christian Schools International, and Summit Ministries. We also use textbooks published by McDougal-Littel, SRA, Addison-Wesley, and a number of college-level textbooks for our AP and dual-credit courses. Incentive Day is a free field trip that rewards students who earn the Principal’s List (All A’s) or Honor Roll (A’s & B’s) each grading period. The day includes a morning activity, lunch at a local restaurant, and an afternoon activity. We usually secure a private rental for our students only at each of the venues. Past trips have included visits to a go-kart park, bowling alley, ice skating rink, rock climbing gym, roller rink, movie theatre, and restaurants like Olive Garden, Moe’s, Yamato, and Chili’s. Why do K – 12 students wear a uniform? The purpose of school uniforms at The Rock School is to foster an atmosphere of learning and self-discipline, create pride within the team, support a studious and disciplined environment, reduce peer pressures, and help remove unnecessary distractions. What are the uniform policies exactly? We offer a flexible uniform program. While students are required to purchase the official uniform items, they have some choice in what they wear to school each day. With a variety of colors and styles available, students maintain some choice while the school accomplishes its goal of a uniform standard. Uniforms are purchased through our Lands’ End store. Can international students attend your school and do you provide housing? Yes, we welcome students from around the world to apply as day students or for our boarding program. For more information, visit our international student page.